Truth be told we in the office are enormous fanboys of Sara Bareilles. We've had the opportunity to film intimate performance pieces and interviews with her these last two album cycles. We've gotten to experience her razor-sharp wit, charisma, and slightly naughty mouth. When we interviewed her last summer she criticized my camera work, relieved me of it, and took a series of funny selfies with my oldest daughter, who floated around NY on a high for at least a week. To be honest the moment reminded me of a similar experience in my twenties, when Katherine Hepburn stomped off a tennis court to berate me for being late to pick my Uncle David up for a drive to Maine. I was with a star who wasn't afraid to be herself. Sara was certainly a star on the rise when she released 2010's Kaleidoscope Heart, but it was her most recent album, The Blessed Unrest, that has placed her in the pantheon of today's, elite pop stars. What's particularly appealing is her authenticity. Her various social media channels give us a peek inside her life and family without letting it all hang out and over sharing like so many celebrities feel compelled to do. The effect is a brand of relatable, goofy humor that is also entrancing. We only get the good moments she chooses to share with us and she doesn't drag us into a breathless dialog of her every moment. On Kaleidoscope Heart, Sara delivered a collection of wonderful songs. That album's lead single — "King of Anything" — though, has been rumored to be a dis track of her then, label president. Fun music but it's hard to emotionally rally around a track that is ultimately cynical criticism and borne out of frustration. The Blessed Unrest, on the other hand, is an entirely different animal and she and her marketing team has knocked it out of the park...of course it only works with music that stands above the crowd. Still, there is lots of great music, the difference is marketing. "Brave" written with Jack Antonoff of fun., became one of the songs of last summer long before her album release in July 2013. The official music video came out in May and spawned thousands of other tribute videos on YouTube set to her music with various interpretations of what it meant to be brave. Endless stories of courage and perseverance touched our hearts and souls and wove this song into collective memories. The fact that Microsoft licensed the song for a series of Windows 8 commercials — which broke her song into the sports world as every major event featured Seahawks quarterback Russell Wilson fiddling the gadget to "Brave" blasts — and carpet bombed us with ads telling us we needed to be brave to buy this dog of an operating system. Through this frenzy of emotional video making Sara and her people responded to the trend by filming responses to the videos and occasionally appearing in them. By the time the album was released last July, it was almost beside the point. Sara appeared everywhere...a quick look around the web reveals dozens of versions of "Brave" on every major national television show. She talked about the song, its meaning and skillfully rode the American publics' overwhelming emotional response to the song. Finally, the song's penultimate moment came when Carol King joined her for a performance at this year's Grammy Awards. One generation's great singer-songwriter passing the torch to a star of the next. The second single from the album, "I Choose You", (perhaps an even more appropriate song for Microsoft), needed a push to ignite the same fire "Brave" stoked. Not surprisingly, this has also been deftly handled. After the Grammy let down (Sara did not win either "Best Pop Solo Performance" nor "Album Of The Year"), Sara put out a message this past March for people to submit how they planned to ask the love of their life to marry them, giving a few lucky winners some assistance in their crucial and magical moment. "Matt & Chelsea" and "Aly & Andrea" were chosen and the ensuing videos are wonderful nuggets of emotional storytelling. 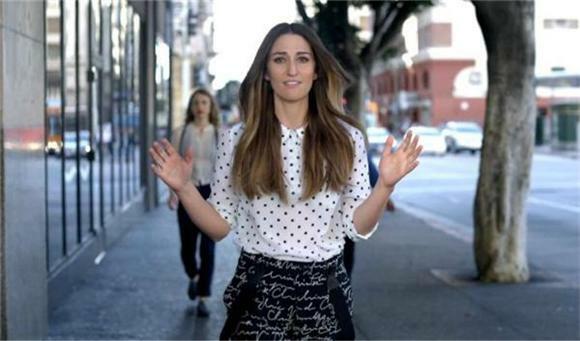 So it seems Sara Bareilles and her brilliant marketing team plucked two massive wins from the bounty of The Blessed Unrest. When we need to express bravery and fearlessness, the aptly titled first single will always be our go-to track. "I Choose You" will soundtrack thousands of weddings to come. I think we are all the better for this and our hat goes off to Ms. Bareilles and her team for making it so. Watch our favorite piece of Sara's promotion, her exclusive mini concert held after her Sleep No More cameo.